Although the church is normally locked arrangements can be made for viewing and there are a number of Open Days during the year when the church will be open in the afternoon see the Events page for details of these. The Organ was built in 1902 by the famous firm of William Hill and Son and was given to the Church by the Charrington family. The original tubular pneumatic action was changed to electric in 1967 at which time the console was moved from underneath the organ case to its present position in the North aisle. The instrument remains tonally unchanged from when it was built and its voices represent the tonal excellence that the company had established and maintained over two previous generations. In 1990 it was decided that extensive maintenance was required and the first Winchfield Festival took place to help raise the money to pay for that maintenance. Martin Neary, former organist of Winchester Cathedral and Westminster Abbey, gave a recital and since then the Festival has boasted recitals by many organists of international fame, including Thomas Trotter, Wayne Marshall and Roy Massey. All agree it is a delightful instrument. At the same time it remains especially suited to accompanying hymns on a Sunday morning. 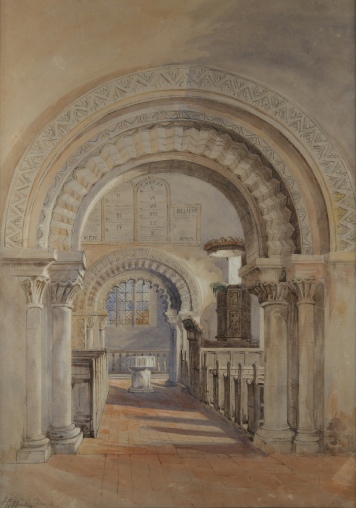 The painting to the left, dating from the 19th Century, shows the Tower Arch in the foreground and the Chancel Arch beyond it with the Font in it original position and the pulpit on the right hand side before the Chancel Arch. The painting has taken some liberties with its depiction of the Tower Arch! The Tower Arch does not have the detailed paterning on the arch shown in the painting - but the arch of the South Door does look like this. 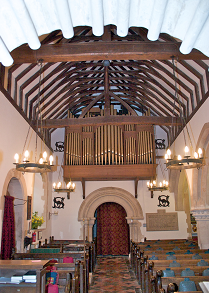 The contemporary photograph, below, shows the interior looking from the Tower Arch towards the Chancel Arch and shows the Font in its new position near the South Door. The Chancel Arch is the glory of this Church. It consists of a group of semi-circular arches carved with chevron (dog's tooth) and other Norman ornamentation. The work is rude and not highly finished but is nonetheless effective. At each side of the Chancel Arch are two square 'squints' or hagioscopes which have been restored. These were used in pre-Reformation (i.e. Roman Catholic) times to enable the people to see the climax of the Mass – being the elevation of the Host. There are four symmetrically placed windows in the Chancel. One on each side is original; the others are imitation. The East Window in the Chancel (above the altar) is also imitation replacing a three light window that is now located in the east end of the North Aisle. At one time there was a large four light Perpendicular window on the South side but this was removed and replaced by the imitation Norman window in 1849. The glass throughout the Church is modern. The South-East Window in the Chancel (pictured to the left) was designed by Laurence Whistler to commemorate Mrs. Charrington of Winchfield House: a tree of life, rooted in her home; a cluster of stars, for her Christian name. There is a large and interesting oak chest on the left side of the Chancel, fitted with three different locks for keeping the Parish Records - altough these are now kept in Winchester. 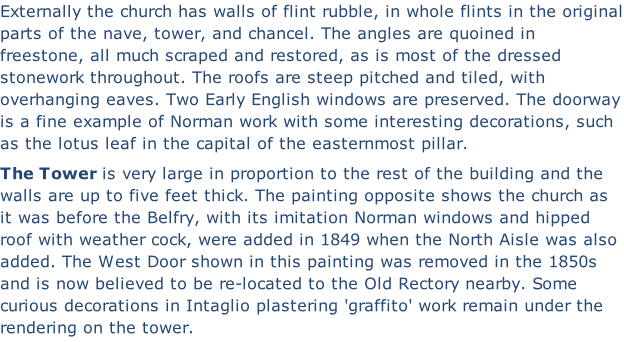 The Rector and both Church wardens would need to be available for its opening in former times. The oaken altar rails are thought to be Jacobean. The original stone altar slab is buried under the Chancel pavement. The Vestry Door and the Vestry itself are modern additions. 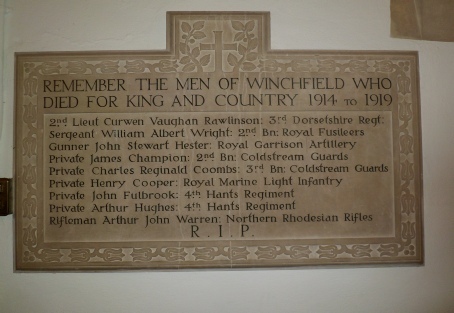 At the rear of the nave is a memorial to those men from Winchfield who died while serving in the Army during the First World War. Some details of the men whose sacrifice is remembered have been compiled and is available here. The Church owns a very interesting Communion cup which is inscribed “The gift of Richard Canon, 1664” It is handworked in solid silver. The other plate is modern. The account of Winchfield that appeared in “A History of the County of Hampshire: Volume 4”, ed. 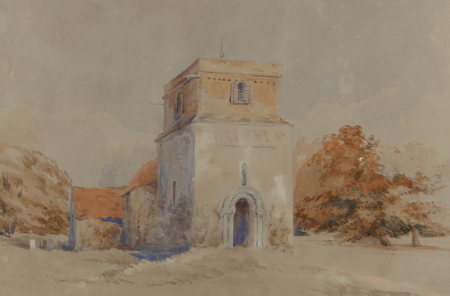 William Page (London, 1911), available here, gives more information about St Mary’s. An aerial survey of the church is available at the link here. “1617 Henry Knight made this bell”. The Font has an original Norman basin and was originally located in front of the Chancel Arch. The Pulpit is a very fine example of the art of the wood carver. 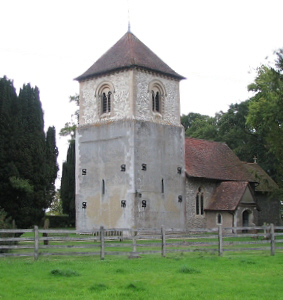 It dates from 1634 and is similar to that in Odiham Church. On the South side of the nave are two ancient oak pews, thought to be 400-500 years old.